Today I am featuring the final item in my sixteenth Fix and the one item I kept. I will also review the entire Fix at the end of the post. Every time I get a box from Stitch Fix I do an Instastories as I open the box and try on the items for the first time.. I save these Instatories on my Instagram profile if your interested in seeing them. When I opened this box, I said I don't really like cold shoulder tops and this was the LAST item I thought I would keep. I have purchased a couple of cold shoulder tops in the past and didn't like the way they looked on me. But, when I put this top on my photographer/husband LOVED it and encouraged me to keep it. So I did! For the photo shoot, I tried the top un-tucked with a pair of skinny jeans and heels. The top is a very thin, lightweight material. Perfect for hot summer days! I liked that the top had thin little straps so I wouldn't have to be tugging it back in place like a off-the-shoulder top. I wore a black multi-strand necklace and carried a red handbag for a pop of color..
My released hem skinny jeans are by Charlotte Russe, shoes from JCP (both old). 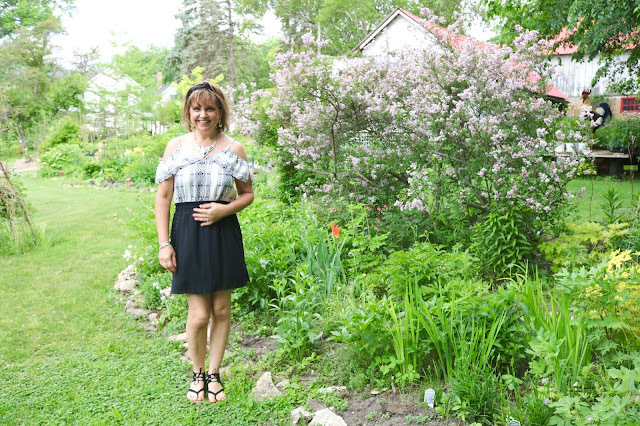 The top is from Skies are Blue and is called the "Yalina Cold Shoulder Blouse". The sleeves have a little slit in them which makes arm movement easier and the top comfortable to wear. I also wore a black bracelet. 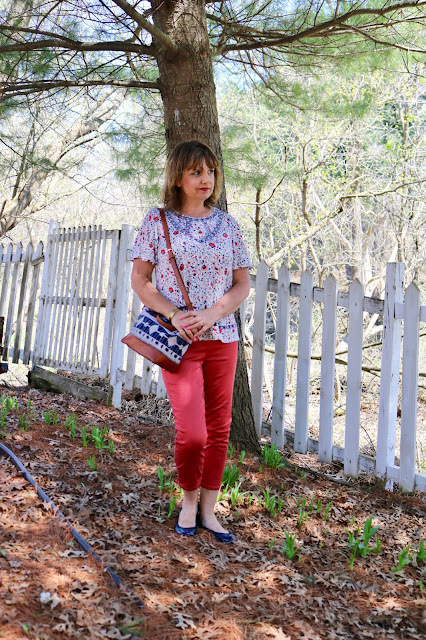 The red bag is a cross body bag and was a gift from my daughter. I have worn the top once since I got it. My husband and I went on a date to a nearby town and I styled the top with a short black skirt. I like the way the top looks tucked in better than untucked it. What about you? Which way do you like it better? And now to review what else I received in this Fix! Overall, this was a really great Fix even though I only kept 1 item. I actually liked everything in this Fix but items were returned either because I had something similar already, the price was too much, or the style wasn't quite what I was looking for. My next Fix, Stitch Fix 17, I kept 3 out of 5 items! And guess what? I got my red pants! I can't wait to show you! Yes! I get why you kept this top. Added bonus - bra-friendly. I prefer the loose version for balance, though I adore your headscarf thingy in the tucked-in styling. Hugs sweetie, x. Thank you! It is a head band actually. I love wearing them in summer to keep the hair off my face and shoulders. Actually I like it both tucked and untucked. I think it's the right length for both options!! It really does look wonderful on you Amy. I think it's a great lesson that we shouldn't always discount a "trend" or "style" because there are so many variations of it that could work. I'm so guilty of the exact same thing---I thought I'd NEVER wear maxis because I'm so short, yet I have a couple of them now and love them!! Thanks Jodie! I'm just happy to have my husband around for a second opinion, because he has been spot on regarding what to keep and what to send back. This is such a cute top! I am like you, I like the straps on cold shoulder tops vs off the shoulder. It's so much easier to wear. 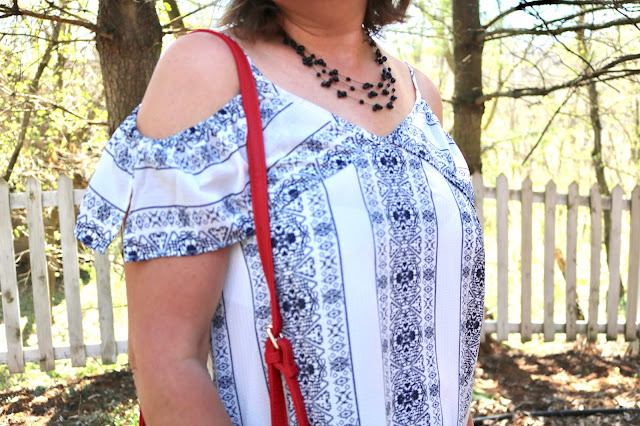 I like the blue and white print of this cold shoulder top. I really enjoyed seeing it styled in two different ways and think they both look great on you! Loving those released hem jeans and how perfectly they fit you. I am not really a cold shoulder fan, either. I have a couple and probably should wear them more while they are still in style. Thanks Jennie! I think a huge factor in cold shoulder is where the cuts are located. I have a red one where the cuts are right on the shoulder and I don't think it's flattering because it shows the fattiest part of my arms. Then I have another one where it's basically just cuts in the upper sleeve. This top is called "cold shoulder" but I think it's more of an off-the-shoulder top with tiny straps! I like it both ways but I especially like it styled with the red bag! Such a cute version of the off-shoulder top! I LOVE that red handbag!!!! It's such a great pop of color! What A cute top! Stitch Fix sounds like a fun idea! Thanks! Stitch Fix is a lot of fun! you red bag is adorable! loving all these outfit combinations for summer! I like the cold shoulder look and have a number of them. I prefer it un-tucked but that is how I usually wear something. Love the red bag and the off the shoulder top you returned. Thanks Nikki! I LOVED the off-the-shoulder top I returned. But it was soooo expensive I couldn't keep it. This blue + white top is so cute, lady! Love the cold shoulder detail- great for warm weather! Thank you! Yes, they are great for warm weather! Oh I would keep that one too! Very cute! What a lovely top! It's so versatile. The wedges are perfect for summer too. I think you kept the right item! 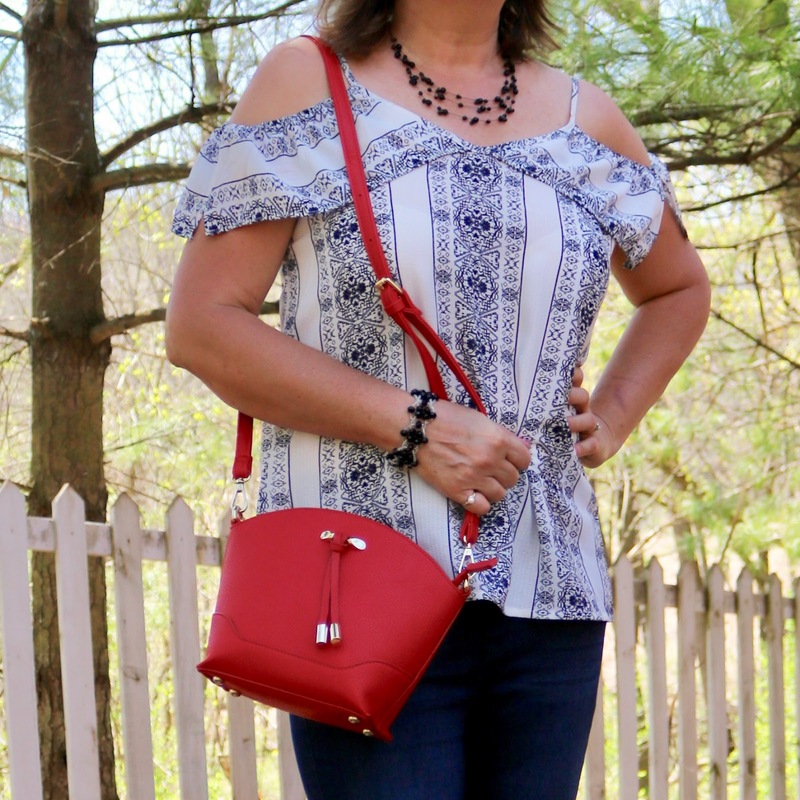 That cold shoulder top is so cute on you! Such a cute top you have there dear! You really can't go wrong with cold-shoulder top on summer! Gosh, you have some amazing willpower! I think all of those pieces look pretty spectacular on you. Love the top you kept and think it looks great tucked and untucked...completely different. Great styling with the black jewelry. Haha! I have to have willpower or I'd be in the poorhouse!